Millard Fillmore (January 7, 1800 – March 8, 1874) was the thirteenth president of the United States, serving from 1850 until 1853, and the fourth and last member of the Whig Party to hold that office. He succeeded from the vice president of the United States on the death of President Zachary Taylor, who died of acute gastroenteritis—becoming the second vice president to assume the office after the death of a sitting president. Fillmore was never elected president in his own right. After serving out Taylor's term Fillmore was not nominated for the presidency by his party, the Whig Party, in the 1852 United States presidential election. In 1856 he failed to win election as president standing for office as the short-lived Know-Nothing movement's candidate. 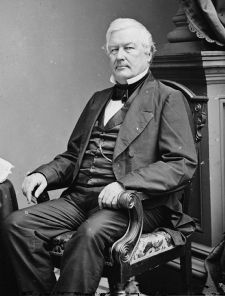 While Fillmore is considered by many as one of the lesser United States presidents, his support for the Compromise of 1850 kept the violence of the American Civil War at bay for more than ten years. He also dispatched an expedition of Navy vessels to Japan under the command of Commodore Matthew C. Perry. By allowing Perry to hand pick the crews for this expedition, helped make the venture singularly successful in opening and broadening trade with the isolationist nation, Japan. Fillmore was born in the Finger Lakes country of New York in January 7, 1800, to Nathaniel Fillmore and Phoebe Millard Fillmore. He was the second of nine children and the eldest son. His parents came over to the frontier town of Locke (now Summerhill), New York from Vermont in New England before his birth. The Fillmores made their living as tenant farmers. Millard spent his youth working alongside his father. He was first apprenticed to a cloth-maker to learn the cloth-making trade when he was 15 years old. Realizing his own inadequate learning, he struggled to obtain an education under frontier conditions. Legend has it that he memorized the words in a dictionary held in one hand while he operated a cloth-making machine with the other. Fillmore had attended one-room schools and his education was sporadic. The only books in his home were the Bible, an almanac, and a hymnbook. With the help of a village schoolteacher, Abigail Powers, Fillmore managed to educate himself. Powers encouraged him to aspire to higher learning. He fell deeply in love with Powers. When he was 18 years old, Fillmore moved to Buffalo, New York to continue his studies. He became a law clerk to a county judge, where he got his early introduction to the law. He was admitted to the bar in 1823 and began his practice of law in East Aurora in Erie County, New York. In 1826 he considered himself financially secure enough to marry Powers, daughter of Reverend Lemuel Powers. The couple had two children, Mary Abigail and Millard Powers. In 1828 Fillmore was elected to the New York legislature and served from 1829 to 1831. In 1830 he moved his family to Buffalo, New York and Fillmore soon became one of the leading lawyers there. Fillmore was elected as a Whig Party candidate to the Twenty-third United States Congress (1833-1835); and elected to the Twenty-fifth, Twenty-sixth, and Twenty-seventh United States Congress (1837-1843). Fillmore was a strong supporter of Henry Clay of Kentucky. Clay was a sterling orator and the leader of the Whig party at this time. Fillmore, along with others and Clay decided that compromising on the slavery issue was important to keep peace. Fillmore did not run for re-election to Congress in 1843, hoping to gain the vice presidential nomination under Clay. This position was given instead to Theodore Frelinghuysen. The Whig Party instead nominated Fillmore New York state governor. In the election, however, Fillmore was beaten by his Democratic Party opponent, Silas Wright, and Clay lost the decisive New York vote, costing him the presidency. Fillmore was elected state comptroller in 1847. This appointment was short lived as Fillmore consented to run as Zachary Taylor's vice presidential candidate in 1848 and they were elected as the last Whig party ticket to lead the United States. Fillmore presided over the United States Senate during the first half of 1850.The opposing sides in the North and South battled over slavery and the land newly acquired from the Mexican War. At this time there were 15 slaves states and 15 free states. If another state were admitted to the union it would upset the balance in the United States Senate. The antislavery faction, led by Senator Seward, the former governor of New York and Senator Salmon P. Chase of Ohio, clashed with the Southerners, led by Senator James M. Mason of Virginia, Senator Jefferson Davis of Mississippi, and Senator John C. Calhoun of South Carolina. Angry words sailed through the halls of the Senate, as they did the chamber of the House of Representatives. President Taylor leaned toward the antislavery side of the debate even though he owned slaves in Louisiana. Determined to uphold the Constitution of the United States, the president threatened to send federal troops to protect disputed New Mexico territory from an invasion by pro-slavery Texans. Finally, on January 29, 1850, Henry Clay presented a compromise. According to the Compromise of 1850, Texas would relinquish the land in dispute but, in compensation, be given 10 million dollars—money it would use to pay off its debt to Mexico. Also, the territories of New Mexico, Nevada, Arizona, and Utah would be organized without mention of slavery. The decision would be made by the territories' inhabitants later, when they applied for statehood. Regarding Washington, the slave trade would be abolished in the District of Columbia, although slavery would still be permitted. Finally, California would be admitted as a free state. To pacify slave-state politicians, who would have objected to the imbalance created by adding another free state, the Fugitive Slave Act was passed. The Fugitive Slave Law required that runaway slaves be returned to their owners. The new law had severe penalties for non-enforcement. A chief grievance of Southerners against the old law was that Northerners would not enforce it. Other sections of the bill abolished slavery in the District of Columbia and settled a boundary dispute between Texas and New Mexico. 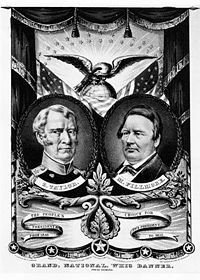 Before the compromise was passed, Zachary Taylor died suddenly on July 9, 1850, and Fillmore took the oath as president. The sudden change in leadership signaled an abrupt political shift in the administration. Taylor's cabinet resigned and Fillmore at once appointed Daniel Webster to be Secretary of State, thus proclaiming his alliance with the moderate Whigs who favored the Compromise. A bill to admit California to the Union still aroused all the violent arguments for and against the extension of slavery without any progress toward settling the major issues. Clay, exhausted, left Washington D.C. to recuperate, throwing leadership upon Senator Stephen A. Douglas of Illinois. At this critical juncture, Millard Fillmore announced his support of the Compromise of 1850. On August 6, 1850, he sent a message to Congress recommending that Texas be paid to abandon its claims to part of New Mexico. This helped shift a critical number of northern Whigs in Congress away from their insistence upon the Wilmot Proviso—the stipulation that all land gained by the Mexican War must be closed to slavery. Fillmore reluctantly agreed to run for the Whig Party presidential nomination in 1852. He wanted to unsure the party platform supported the Compromise of 1850. After securing that, he asked that his name be withdrawn at an opportune moment and his delegates transferred to Daniel Webster, another contender for the Whig presidential nomination. However, this was not done and General Winfield Scott was named the party's candidate. In November, Scott was decisively defeated by his Democratic opponent, Franklin Pierce. After the 1852 election the Whig Party broke up over the slavery issue. 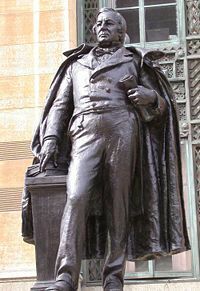 President Fillmore returned to Buffalo after losing the election. His beloved wife, Abigail, died about a month later. As the Whig Party disintegrated in the 1850s, Fillmore refused to join the Republican Party; instead, in 1856, he accepted the nomination for president of the Know Nothing (or National American) Party. On February 10, 1858, he married an Albany widow named Caroline Carmichael McIntosh. His later interests included the University of Buffalo, and he was its first chancellor. He was a founder of the Buffalo Historical Society and the Buffalo General Hospital, and he was active in other community projects, such as the Natural Science Society. He died at 11:10 P.M. on March 8, 1874, of the after-effects of a stroke, with his last words alleged to be, upon being fed some soup, "the nourishment is palatable." On January 7 each year a ceremony is held at his gravesite in the Forest Lawn Cemetery in Buffalo. The myth that Millard Fillmore installed the White House's first bathtub was started by H. L. Mencken in a joke column published on December 28, 1917 in the New York Evening Mail. Having found the White House devoid of books, Millard Fillmore initiated the White House library. As of 2006, Millard Fillmore remains the last U.S. president who was neither a Democratic Party nor a Republican Party member, although Abraham Lincoln was re-elected in 1864 running on the Union Ticket instead of as a Republican with Democrat Andrew Johnson as his running mate. Fillmore, Utah, located in Millard County, Utah was named after this president. This page was last modified on 5 October 2018, at 15:07.